YouTube is the worlds largest collection of user uploaded videos and as we speak there are thousands of videos being uploaded simultaneously . which makes It pretty much impossible to run out of videos to watch on YouTube . When you have a internet connection , you can access YouTube anytime . but what about when your internet connection is down ? One thing that i am sure is , without an internet connection YouTube is of no use to anyone . That is why many a times i prefer to download videos from YouTube and watch them later , and in any case if my internet is down i don’t have to get bored . There are many websites online that offer to download YouTube videos for free. All of these websites are capable of downloading one video at a time , but none of them are capable to download multiple videos from YouTube . This is where you can use a free program called Free YouTube Download to download multiple videos from YouTube . Using this program you can easily download multiple videos from all YouTube channels , playlists , categories and even covert them all to a different file format . – work via proxy servers and VPNs. For a free software , this is more than you could even bargain for and i can’t even imagine any other important feature that has not been included in this program . Like most free softwares do , Free video download comes with a few bloatwares too . But you don’t need to worry about them , as you can choose custom installation ( advanced ) and select the only features you want . Follow the instructions below to download multiples videos from YouTube . Step 1: Download and install Free YouTube Download . Be careful for bloatwares when you install this program , select custom installation and un check all the bloatwares in the installation process . Once the program is installed run it . Step 2: Copy the link of any YouTube channel , playlist or category from your web browser’s URL bar . 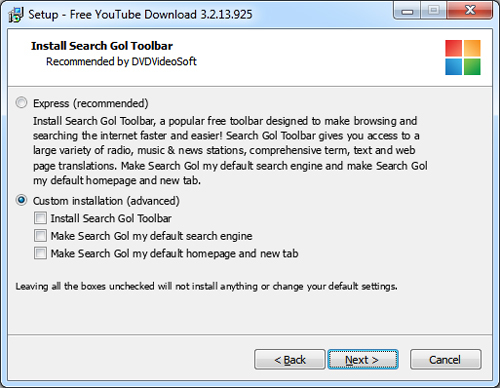 Step 3: Right click on free YouTube download and select paste URL . Step 4: Wait for a few seconds as the program detects all the links . When its complete you will see the channel name with number of videos in it and the total download size . Step 5: Click on the channel name and in the window that opens up , manually select all the videos you want to download . Step 6: From the playlist windows drop down , select the video resolution in which you want to download the YouTube videos and click on close . Step 7: Now On the program’s main window , you can see all the total number of videos selected from the YouTube channel and the overall size of the downloads . Step 8: Click on the download icon to the right and the program will download all the selected YouTube videos . Thats it , now depending on your internet connections download speed it might take some time to download the videos , after which you can watch them any time at your leisure .